Today is Martin Luther King, Jr. day in the US. It’s a day for celebrating the work and achievements of this remarkable man and activist who became the most celebrated leader in the civil rights movement. Many, many student notebook pages will be filled with facts and stories about him, but we’d like to suggest a slightly different approach: coding to ‘show what you know’ about Martin Luther King, Jr.
Below you’ll find 2 different coding activities, free to use, that will help your class express their knowledge and understanding in a digital, dynamic way that also improves their coding skills. For younger students, or those starting on their coding journey: Design a digital museum to show what you know about Martin Luther King, Jr.
Code a digital museum in Scratch to show what you know about Martin Luther King, Jr.
Visit this activity: Design a digital museum about Martin Luther King Jnr. Related reading - Read up on Martin Luther King, Jr.’s life and work, as well as related civil rights facts and info. Primary source - read an original newspaper excerpt from 1957 The Oberlin Review, Oberlin, Ohio about Dr. King’s speech on the topic "Justice without Violence". 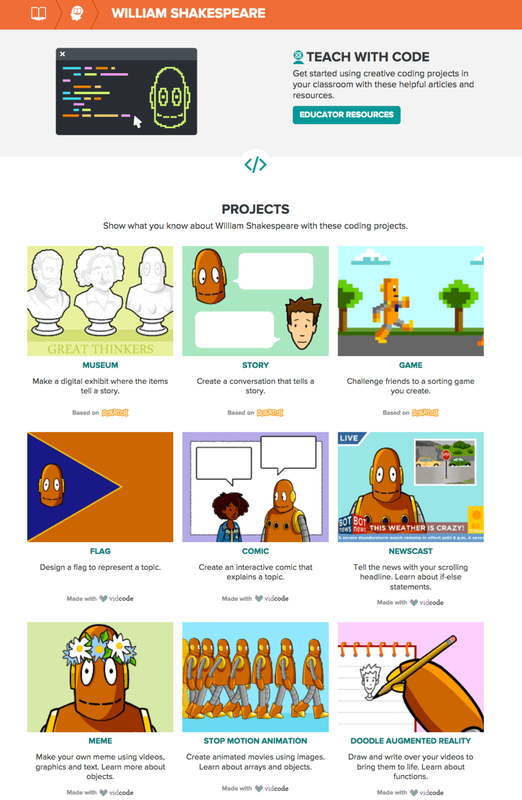 You can now access Vidcode AND Scratch based coding projects inside a huge range of BrainPOP and BrainPOP Jr. curriculum topics. What sorts of things will children be able to do in a Creative Coding project? What's our approach to helping you teach coding? Designed to seamlessly integrate with what you’re already teaching, Creative Coding makes it simple to introduce coding and provides students with the opportunity to “show what they know” in a whole different way. We make coding part of what you're teaching, not a separate technology driven exercise. The block- and text-based projects are developed based on Scratch and Vidcode. Block-based coding, based on the Scratch visual programming language, is an effective way to introduce computational thinking that fosters creative expression and experimentation. Perfect for younger pupils, or those new to coding. There's a huge amount of Creative Coding teacher support material in our Educators site, but maybe start with our 'About Creative Coding projects' support page that details each type of project. How do I unlock Creative Coding in BrainPOP? Creative Coding is an optional add on feature, priced separately to your main school subscription. You also must have a whole school licence to BrainPOP and/or BrainPOP Jr. PLUS individual teacher and student accounts enabled on your subscription. If you see this padlock icon on a Creative Coding button on a topic page this means you do NOT have it unlocked. Get in touch today to get a no obligation quote to enable Creative Coding for your school. We're currently running a promotion too - save 25% if you add it to your subscription before December 31st 2018.